Thank you for visiting the Performing Fluency website. Performing Fluency is an interdisciplinary approach to language learning. It was designed to provide practical student-centered performance-based activities that improve confidence, spontaneous speech, clear expression, paralinguistic features, cultural and academic literacy, as well as reading and writing. Their e-book, Drama in the Language Classroom, has just been published by the University of Michigan Press. Click below to preview and order. "In addition to making visible, tangible, and even doable the mystery that lies behind the doors of your drama-infused classrooms, the writing style is clear, engaging, and energized." Pamela S. H. Bogart, author of MOOCs. English Language Institute - University of Michigan. On August 8, 2019, Deric will present a paper on this collaboration, titled "Transdisciplinary Collaboration in Action," at the Association for Theatre in Higher Education conference in Orlando, Florida. In March 2019, Carmela and Deric co-taught a teacher training workshop on Performing Fluency called "Teaching Language Skills with Drama: Practical Activities for All Classrooms" at the TESOL International Convention in Atlanta, GA. This presentation was selected as Michigan TESOL's "Best-of-Affiliate." Also in March, Carmela and Deric co-taught a workshop at the University of Michigan. 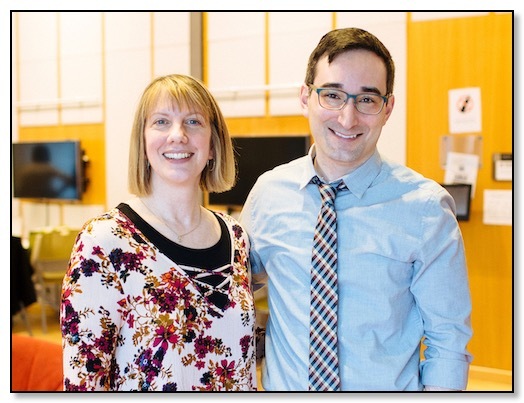 Since beginning their interdisciplinary collaboration in 2014, Carmela Romano Gillette and Deric McNish have developed innovative performance-based approaches to English language learning. Experts in their respective fields, they devised these techniques while co-teaching several courses at Michigan State University and the University of Michigan. This work has been disseminated at ESL conferences such as MITESOL, TESOL International Convention, and MWAALT, as well as at theatre conferences including VASTA-PAVA, ATHE, and MATC. It is the subject of their upcoming book from the University of Michigan Press. Carmela Romano Gillette, PhD, is a Lecturer in the University of Michigan's English Language Institute. She earned a PhD in Literacy Education from Oakland University and an MTESL from Arizona State University. She also holds a bachelor's degree in Theatre and English. Carmela has taught English for over 25 years in multiple contexts, including adult education and community programs, corporate settings, tutoring, community colleges, and universities. She has been involved in literacy coalitions and the Michigan TESOL affiliate for many years and is active in the Literary Research Association's adult literacy initiatives. Her teaching specialties include academic English courses and training for prospective teachers and international teaching assistants. Carmela's research interests center on academic literacy and the access students have to it, the value in providing authentic opportunities for students to use English, and fostering the integration of international students across university communities. Deric McNish, MFA, PhD, is a Program Director and Assistant Professor of Theatre at Michigan State University. He is also a Senior Editor of the International Dialects of English Archive. He earned a PhD from the University of Colorado Boulder and an MFA from Case Western Reserve University and the Cleveland Play House. He has taught drama-based English language courses at the University of Michigan's English Language Institute and Michigan State University's English Language Center. Deric received the 2019 Teacher-Scholar Award, the 2017 Innovation and Leadership Award for Faculty, the 2017 Fintz Award for Teaching Excellence in the Arts and Humanities, the 2017 AT&T Instructional Technology Award, and the 2016 Dudley Knight Award for Outstanding Vocal Scholarship. Deric's research focuses on inclusive, accessible, and interdisciplinary approaches to teaching and learning. Recent publications include "Performance of Fluency" in the Voice and Speech Review, "Training Actors with Disabilities" in New Directions in Teaching Theatre Arts (Palgrave Macmillan), and "A Moving Target: Success and the Reset Button" in Perform: Succeeding as a Creative Professional (Focal Press). © 2019 Deric McNish and Carmela Romano Gillette. Photography by Kellyn Uhl.